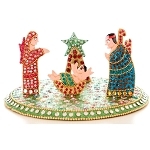 Not your grandmother's nativity! 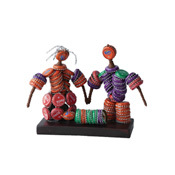 Recycled soda caps are cleverly assembled to create these brightly colored figures, affixed to a dark wooden base. Patterns will vary. 80 disabled men and women artisans are helped to overcome their physical limitations and are empowered economically and socially to become fully integrated members of their communities. In stock, ships within 1-5 business days. Starlight Nativity White LIMITED EDITION Hand Cast Stone Made in U.S.A.
Washington National Cathedral Nativity Hand Cast Stone Made in U.S.A. Advent Wreath-WNC Hand Cast Stone Made in U.S.A.
World at Peace Hand Cast Stone Made in U.S.A.